The Digimon Reference Book profile for November 6th, 2015, is Karatsuki Numemon. A translation is provided below; you may use it freely on forums, wikis, etc. so long as you link back to or cite back to this page. Profile: Crustacean-type Digimon. 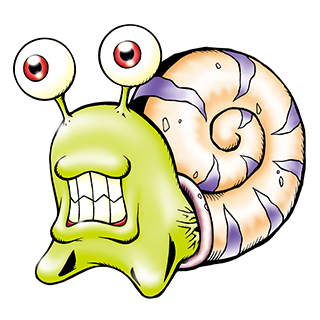 A Numemon that uses a shell it found to protect itself. Because of that it's considered a little smarter than basic Numemon, but also of a somewhat more cowardly personality, prone suddenly withdrawing into its shell. When withdrawn its defensive power is immense, remaining firm even if kicked or tread upon. 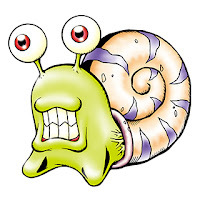 Its special move is to hide inside and attack with its shell "Shell's Attack," and to throw the feces it's stockpiled inside its shell, "Fermented Poop." The Digimon Reference Book is Bandai's official bible on the various Digimon species, first launched in 2007 and now comprising over seven hundred different Digimon out of the thousand-plus species that exist. It updates weekly with new Digimon profiles. Last week's profile was Solarmon.